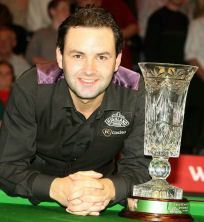 Scotland's Stephen Maguire won his third ranking title at the Northern Ireland Trophy. Maguire beat Fergal O'Brien from Ireland 9-5 in the final to capture his first ranking title since the 2004 UK Championship. For the second straight ranking tournament 2006 world champion Shaun Murphy (England) lost out 6-5 in the semi-finals. He was beaten by Maguire and Northern Ireland's Mark Allen lost 5-3 to O'Brien. Defending champion Ding Junhui (China) was ousted 5-3 by Maguire in round three. Maguire received £30,000 for the victory. O'Brien won £15,000 as runner-up. Ronnie O'Sullivan (England) won £20,000 for his 147 tournament high break. That was the seventh maximum of his career. He accomplished the feat in a breathtaking display against Allister Carter where he won 5-2 with five centuries. That's a first for a best-of-nine ranking match. The win lifted him from fourth to third in the provisional rankings. O'Brien's runner-up spot moved him all the way from No.31 to No.19. Murphy is the new leader, O'Sullivan stays in second and John Higgins (Scotland) drops from first to fourth. The event took place at the Waterfront Hall, Belfast, Northern Ireland Nov 4-11, 2007. It was the third tournament of seven on the 2007/2008 Main Tour. Next up is the Maplin UK Championship 8th December.